Director Tamo Campos and special guests in town for a Q+A. Champagne reception before the film, each ticket includes a glass of champagne. 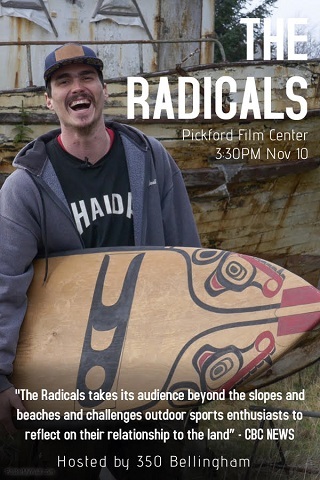 The Radicals follows an active group of snowboarders and surfers who drift from their respective sports into the world of activism. Together they journey across the West Coast of British Colombia, weaving a story of learning, inspiration and resistance. From the Tahltan fight for the Iskut Headwaters, BC Hydro’s corruption in Xwísten, art as resilience on Haida Gwaii, to a coastal uprising against fish farms, each community teaches the athletes to understand what it means to be a true radical. Combining visually stunning sport photography and behind the scenes of frontlines, the film’s trajectory fulfills the athlete's quest for extreme landscapes while uncovering critical social issues and resistance.